My mother was not much for salads. What she called a salad was a wedge of iceberg lettuce doused with a mixture of ketchup and mayonnaise. Ugh! I grew up salad-less, except for visits to Nana’s house — my Gram. Nana always had fresh leaf lettuce growing among her pansies. With such availability, she served salad with every dinner. Occasionally, she served coleslaw. It wasn’t until I was grown and feeding my own family that I realized cabbage replaced the leaf lettuce when the temperatures dropped and snow flurries began to fall. Goodbye leaf lettuce and pansies! Since most of my visits to Nana’s were in the summer, I missed the coleslaw-making lessons. 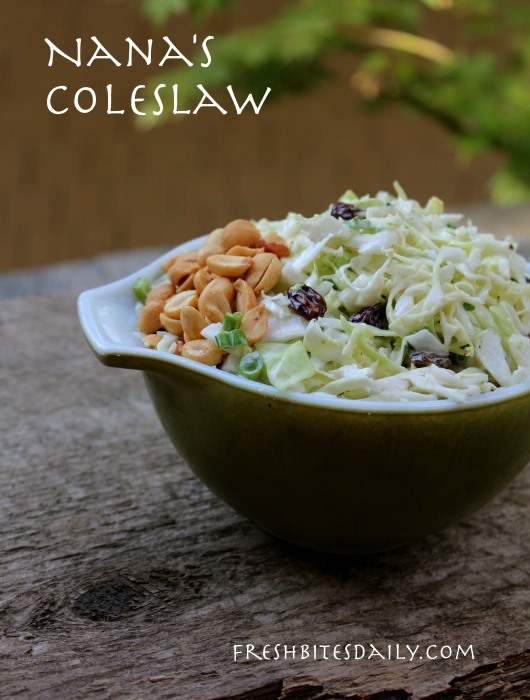 Occasionally I would choose coleslaw in the college cafeteria line or order it in a restaurant, thinking that I would be served Nana’s slaw. Not! It was always filled with mayonnaise, not the light fresh flavor I remembered from early years. On the first trip back East to visit Nana after having my own family, I asked for a coleslaw lesson. I pass that lesson on to you here. In the past 30 years I have served mountains of this salad to retreat groups and guests who usually asked for the recipe. 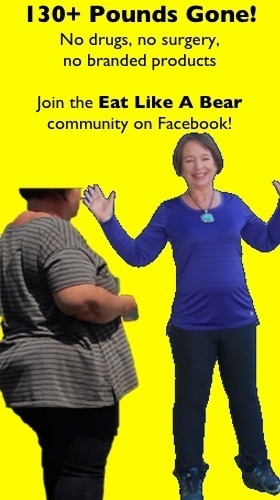 Now it’s yours! Remove wilted or damaged outer leaves from the cabbage. Quarter the head of cabbage and remove the solid core. Send the outer leaves and core to the chickens or the compost. Cut the quarters in half so you now have eighths. Using your sharpest large knife, slice the cabbage eights into the thinnest slices you can. The thinner the slices, the crisper the salad will seem and the easier it is to chew. Pile the cabbage slivers in a large mixing bowl. Wash and trim the green onions. Remove any discolored outer layers. Trim off the root end and frayed top green ends. Holding 2 or 3 onions together on the cutting board, slice them as thinly as possible. This is a lot of onion for a salad. One of the secrets to it working is that the onion is so thinly sliced that you do not experience a “bite of onion”. Toss the onion with the cabbage for a uniform distribution of onion. Mix the mayonnaise and sugar in a small bowl. Stir the two together to dissolve the sugar. Add the vinegar, salt, and pepper. Mix well. Drizzle the dressing over the cabbage and onion mixture. Toss gently but thoroughly. The plan is to coat every sliver of vegetable with dressing. Allow the salad to sit for 15-30 minutes and toss again. 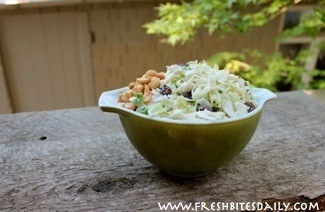 The volume of the salad will have decreased measurably and you may want to move the salad to a smaller serving bowl. The dressing will have begun drawing juices from the vegetables and the salad will seem much “saucier” than it did initially. The cabbage and onion juice thins down the mayonnaise presenting a much lighter, fresher flavor than if you had gone with straight mayonnaise to begin with. Making slaw that way tends to seal in the vegetable juices rather than draw them out. 12. Add either raisins or peanuts or both to this salad. They are always well received. Nana’s slaw is at its crispy peak on day one. However, it refrigerates well for about three days, still light and tasty, but not as crisp.